Make these popular dim sum favorite, Jian Dui or Sesame Seed Balls at home. These are gluten free with a little sweet potato mixed into the dough. Jian Dui when translated means “fried heap”. I know this does not sound pretty but I assure you these deep fried glutinous rice balls are a true delight. They are crunchy on the outside and chewy on the inside and are delicious accompanied with a cup of jasmine or chrysanthemum tea. 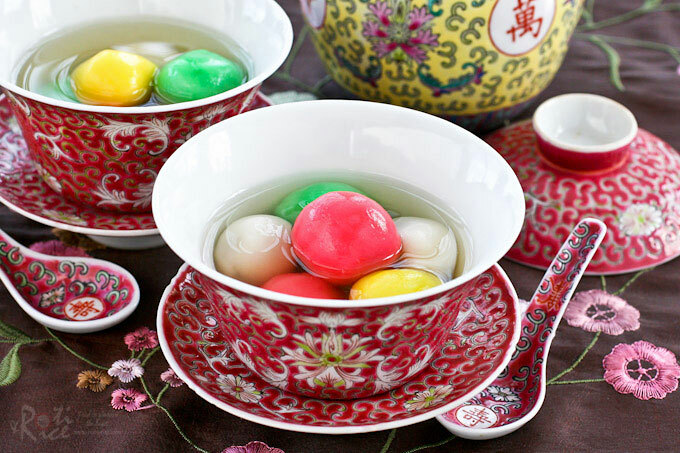 Their composition is similar to the traditional Tang Yuan (glutinous rice balls in sweet clear soup) dessert I posted recently. Commercial Sesame Seed Balls are usually made with just glutinous rice flour with a little wheat starch added to it. They tend to have a thicker, harder and crunchier exterior with a small amount of filling. Homemade ones sometimes come with mashed sweet potato added to the dough. This makes the balls a little softer but still equally if not more delicious. The mashed sweet potato also gives the Jian Dui a nice golden color, contrasting beautifully with the sesame seeds. In the recipe below, I have decided to omit the wheat starch so that they remain gluten-free. I also did not add sugar to the dough as the red bean paste filling is already sufficiently sweet. I made the balls quite large, about 2 inches in diameter but you can certainly make them smaller if you prefer. Caution : Always be extra careful when deep frying. Some have experienced the sesame seed balls exploding while deep frying. Make sure the heat level is at medium to medium low and fry the balls for no longer than 3 minutes per batch. They should be cooked as the crust is pretty thin. Remove any balls from the hot oil immediately if you see them expanding. Out of the 12 that I fried, only the first one expanded a little more but did not explode. Boil sweet potatoes in a medium sized saucepan with 1 cup (240ml) of water for about 10 minutes or until very soft. Remove from heat and mash sweet potatoes with a potato masher. Set aside to allow it to cool. When sweet potatoes are cool enough to handle, add glutinous rice flour, baking powder, and approximately ½ cup (120ml) water to the sweet potatoes. Mix with a spatula until dough comes together. Knead for 2 to 3 minutes. Add a little more glutinous rice flour or water if needed to form a smooth non-sticky dough. Divide dough into 12 equal portions. Divide red bean paste into 12 equal portions**. Roll into balls. Flatten a portion of dough on the palm of your hand. Place a ball of red bean paste in the middle. Wrap dough around red bean paste. Roll dough with filling between your two palms to form a smooth round ball. Repeat with the rest of the dough. Place sesame seeds in a shallow bowl. Roll glutinous rice balls in sesame seeds. Compact the sesame seeds into the glutinous rice balls by rolling them between your two palms. Heat about 1½ inches (4cm) deep vegetable oil in a medium sized saucepan over medium heat. Gently lower 4 glutinous rice balls into the hot oil and fry until golden brown. This will take about 3 minutes***. Remove with a strainer onto a paper lined plate. Repeat with the rest of the glutinous rice balls. **You can divide the dough and red bean paste into 16 or 20 portions if you prefer smaller balls. ***Always be extra careful when deep frying. Some have experienced the sesame seed balls exploding while deep frying. Make sure the heat level is at medium to medium low and fry the balls for no longer than 3 minutes per batch. They should be cooked as the crust is pretty thin. Remove any balls from the hot oil immediately if you see them expanding. Out of the 12 that I fried, only the first one expanded a little more but did not explode. These look to die for, Biren. I love the add of sweet potato in the dough. We love these but I’m very lazy to make as have to deep fry !! I will try your recipe. My mother-in-law made with only 10% sweet potato but you added 4/5 parts. So the skin is orange in color !! Look great and colorful !! The old people used to ask all to leave before she deep fried them as it might burst, they blamed someone said some unlucky words actually due to not sealed properly, the filling leak out !! The dough is softer with more mashed sweet potatoes. You can reduce the sweet potatoes if you prefer a crunchier crust. In response to Rebecca: I have made these before and have some scars because of the breaking open of the balls! I would like to try again but needt to know if this recipe (which has water in the dough) will not erode and cause me further emotional/physical scarring 😉 they are worth the trouble because the taste is soon wonderful. I made 12 of these balls and only one partially expanded but did not explode. I used only medium to medium low heat and only fried it for 2 to 3 minutes as the crust is quite thin as you can see in the pictures. Of course, I cannot guarantee that they will not explode in your kitchen but I was fortunate that mine did not. I’ve had these at restaurants, but never made them myself. Pretty easy, actually, and they look so nice. Good post – thanks so much. Oh to see Sesame Balls twice in one day tells me that this is going to be a GREAT day! This is my favorite treat!!! When I eat dim sum at a local restaurant, I ALWAYS get the Sesame seed balls! Shannon’s are boiled and yours are fried and who on earth doesn’t like fried! Thank you for this wonderful recipe! My family love these too! You are very generous with your filling! That’s the best part about making these at home. We can afford to be generous with the filling. 🙂 Happy Dong Zhi to you! Those were the days…sweet childhood memories! These are really tasty and my favorite are the ones with this red bean paste and also lotus seed paste. Yes, the exploding can be scary but I was fortunate none of these exploded. I fried only 4 at a time and watch them like a hawk. I took them out before they had a chance to expand too much. Hello Biren & greetings from France. Denise’s lovely blog brought me here 🙂 Both of you have fabulous blogs for homesick asian foodies like me. I love these sesame balls. I’m a lazy cook but your recipe is simple yet precise so I’ll give this a go tomorrow as an added treat for Sunday brunch (fingers crossed). I’m so anxious to taste them already. Welcome Jeanne! So glad that you visited. Good to hear you enjoy both Denise and my blog. 🙂 All the best with your jian dui. They really are not that difficult to make and are well worth the effort. Tried this today and it turned out great with my family enjoying it. Thank you. Hi Biren! Thanks for the recipe! My all time fav during yum cha! Now I can make it my own! I tried it today and may I know rough how many gram per ball did u put for the dough? When I fried it get out of shape and inside wasnt that cook.. Please advice.. Loved this recipe heaps! Thnxx!!! I did not measure the weight of each ball of dough but I think it is roughly 60g. Perhaps your oil was too hot and the jian dui browned too quickly. You will have to fry it for about 3 minutes. It will be slightly soft on the inside because of the sweet potatoes. I have not tried baking the balls but you can certainly give it a try. They will probably not have such a nice even color though. I would not recommend freezing them before frying for fear that they may explode. Thanks for the well wishes and the same back to you. Have a Happy and Healthy Chinese New Year! I do bake them all the time: I put the balls on an oiled cookie sheet, roll the ball in the oil to coat them lightly and turn the oven around 400 F, then I place the balls below the element (not too close though). When they inflate and turn golden I remove them. The outer part get crispy when baked, but they deflate and become soft after a while. You can heat them a little again before eating. That’s good to know, Catherine. I will give it a try the next time. Thank you! I love following your posts as I get to find out how to cook these delights fom home. I definately will keep this recipe because IT IS MY FAVOURITE. Your tutorial sound easy to make. Thousand thanks for it. I grew upp eating a version of these that were filled with coconut, any idea how I can reproduce that ? Love these, would be awesome to make fresh at home ! I have not encountered those filled with coconut but it should not be too difficult. Perhaps you can check out my Pulut Inti recipe for the filling. Do I use 1 tsp baking powder OR 1 tsp baking soda? You mention both and I’m not sure which one to use. Thanks! It should be baking powder as per the ingredients list. Does the glutinous rice flour have to be cooked? I noticed that many asian dessert recipes call for “cooked glutinous rice” (such as mooncakes, which I just made for the first time a week ago) but this tiny detail is often omitted. I know “koh fun” is also sold in asian supermarkets, alongside regular glutinous rice flour, so I was wondering if that made a big difference? I’ve never made jian dui before and am excited to try this recipe! No, the glutinous rice flour in this recipe does not need to be cooked because it will be deep fried after being shaped into balls. You are probably referring to snowskin mooncakes where the formed mooncakes are not baked. Hence, the flour needs to be cooked beforehand. I have personally not seen “koh fun” here. For my Snowskin Mooncakes, I used a mix of cooked glutinous rice (which I cooked on the stove) and a snowskin premix purchased in Singapore. I used soft cake flour for my Traditional Mooncakes. The orange yam/sweet potato certainly give a very nice color. FYI, in Indonesia, sesame seeds balls are usually filled with yellow (skinless) mung bean paste cooked with sugar and pandan leaves. Thanks for the info. In Malaysia, the are 3 kinds of filling used – red bean paste, lotus seed paste, and also mung bean paste but the first two are more popular. Thank you for the recipe. My son as just asking me where to buy this. Can I substitute sweet potato with pumpkin? How much sweet potato is too much. I made it and it did not have the same orangish color. I would like to put more sweet potato, but I don’t want to use too much. Just go according to my recipe and it should be fine.